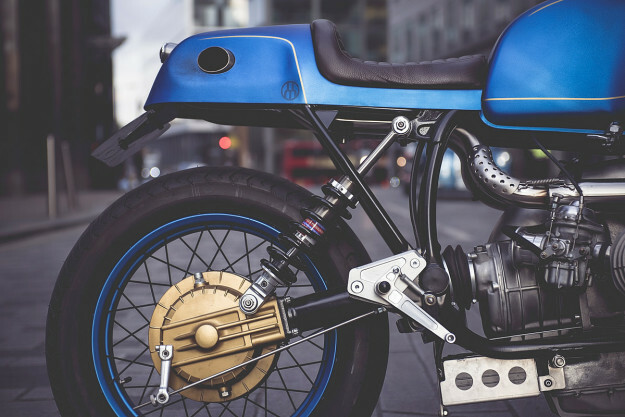 You don’t have to see the latest build from Untitled Motorcycles to recognize its racing pedigree. Hear it on the street and you’d swear you were at the track. 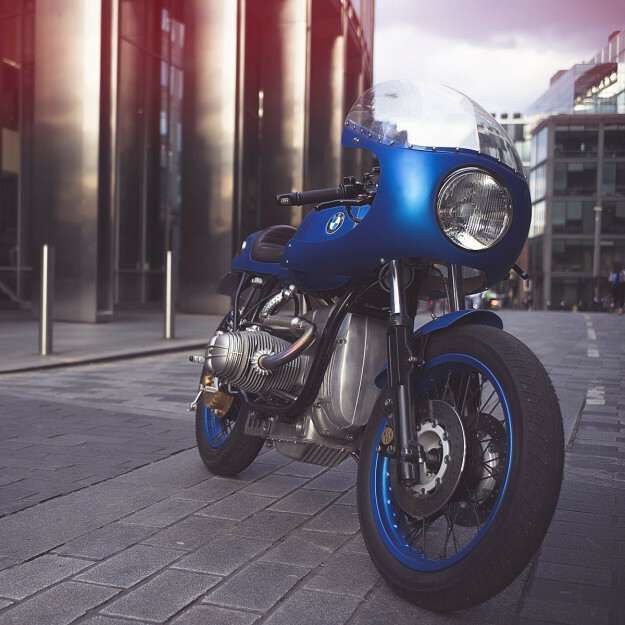 UMC-028 was built for a British customer, a man lucky enough to grow up around high-performance motorcycles and cars. 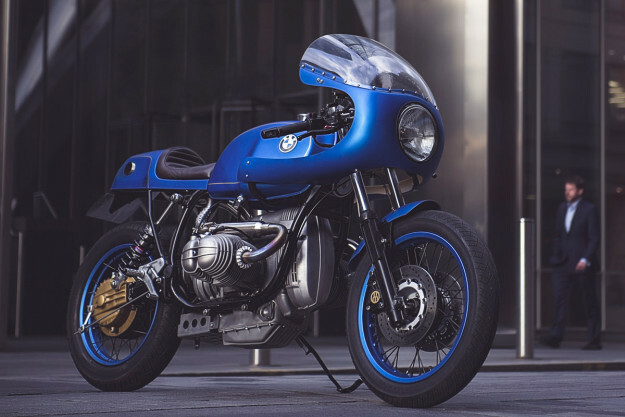 It’s inspired by the evocative endurance racers of the 1980s and based on a 1986 BMW R80 Mono. Untitled then bead-blasted the engine, and laboriously hand-brushed the surfaces to bring back the original luster. 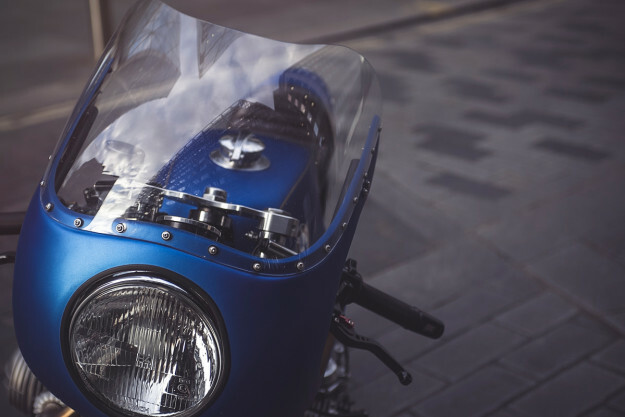 There’s a custom alloy cover in place of the stock airbox, and free-flowing bellmouth inlets attached to the 38mm Bing carburetors. 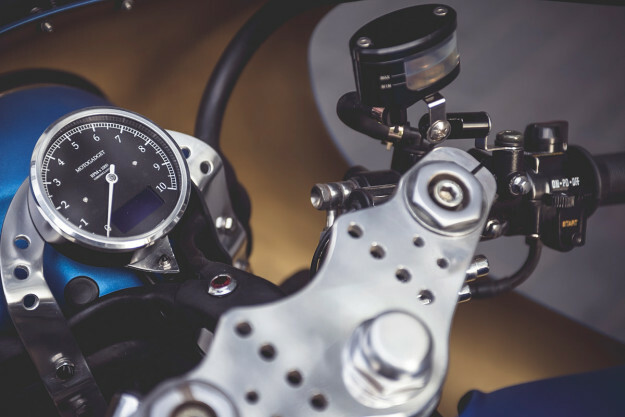 These are not merely cosmetic mods: tuning the bike on a rolling road has optimized performance beyond the factory specs. The original frame was de-tabbed, sandblasted, and powder-coated in a satin black. The battery has been replaced by a smaller gel version: it’s been relocated under the engine, inside a custom-fabricated stainless steel battery box. Modified Mombaerts rearsets and a modern Hagon shock reinforce the clean, purposeful look. There’s a new sub-frame designed to fit the racing seat unit—and accommodate that most unusual exhaust pipework. It’s a beautiful over-and-under system, designed and fabricated in-house, and exits dramatically from the sides of the (insulated) tail unit. A spoked rear hub was re-engineered by UMC to fit the Mono’s final drive, and laced to a painted 17-inch GS rim. Both the rear and 18-inch front wheel carry BT45 Battlax tires—”which handle beautifully and distribute tire wear equally,” says Adam. 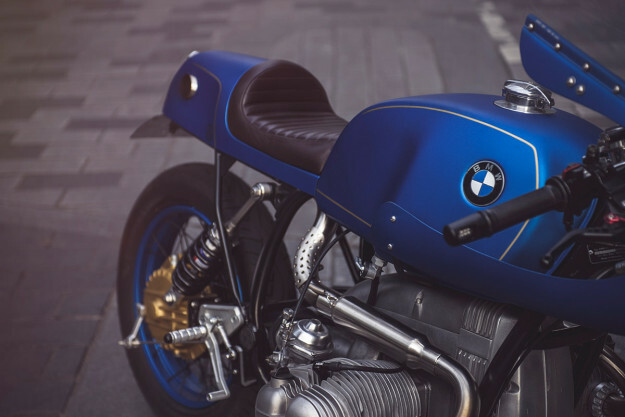 The original BMW tank, now with a Monza-style racing cap, was kept for its extended range and classic look. 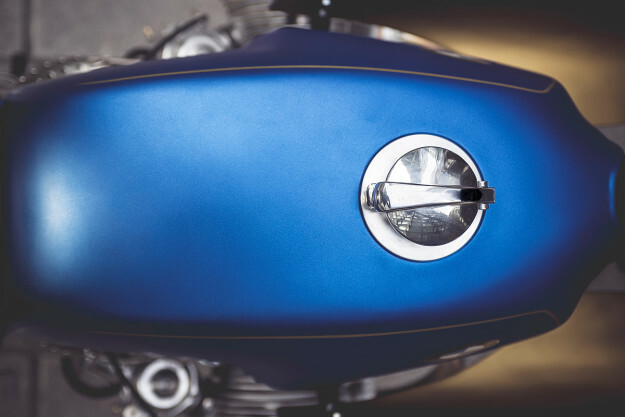 Custom brackets and mounts were crafted to accommodate the 1970s-style Ducati 750 bubble fairing and modern headlight. And then everything was painted in a striking metallic blue color with gold pin striping. Fast bikes need fast brakes, so progressive forks were fitted to accommodate twin Brembo calipers and deep EBC discs. 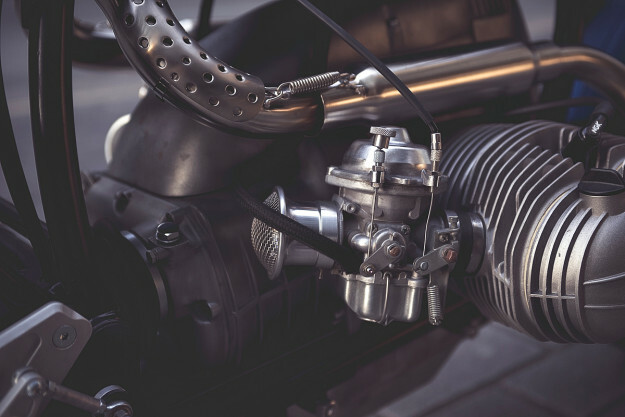 Up top, a machined yoke keeps everything solid and controls from a 1970s Kawasaki Z1000 are attached to modern clip-ons—with a modern brake master cylinder too. A Motogadget tacho completes the simple, race-style cockpit. 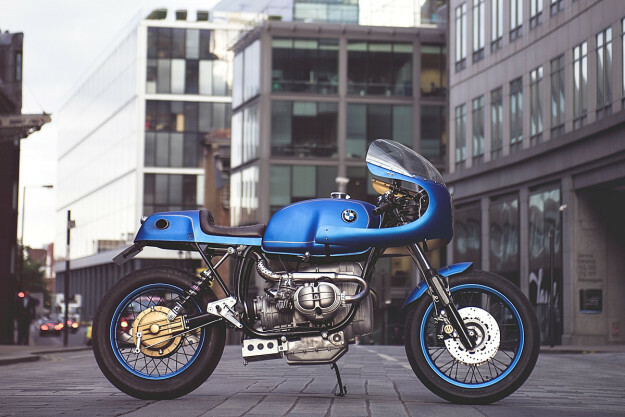 It’s a refreshingly different take on the ubiquitous BMW cafe racer, and finished to an unusually high standard. Consider it the thinking man’s airhead. Thanks to: Rex Martin, engine rebuild | Nikos Kartampanis, fabrication | Anita Chatelan, electrics | Denis at D’Lucks, paint | Glen Mogor, solo seat | Armourtex, powdercoating.